[Cracked] Modern America, Explained With Charts » WHUZZUP! 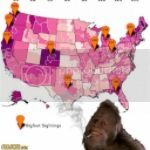 By CRACKED Readers Published: June 02nd, 2017 – America's a really complicated place to understand -which makes sense when you consider how big a cultural melting pot this country is. And, despite what some people would have you believe, that's not a bad thing at all. It just makes things a little confusing to decipher. Fortunately, charts are great for clearing things up. Here's a bunch that explain America.